This is why I want to knit...to make sweaters for my puppies. 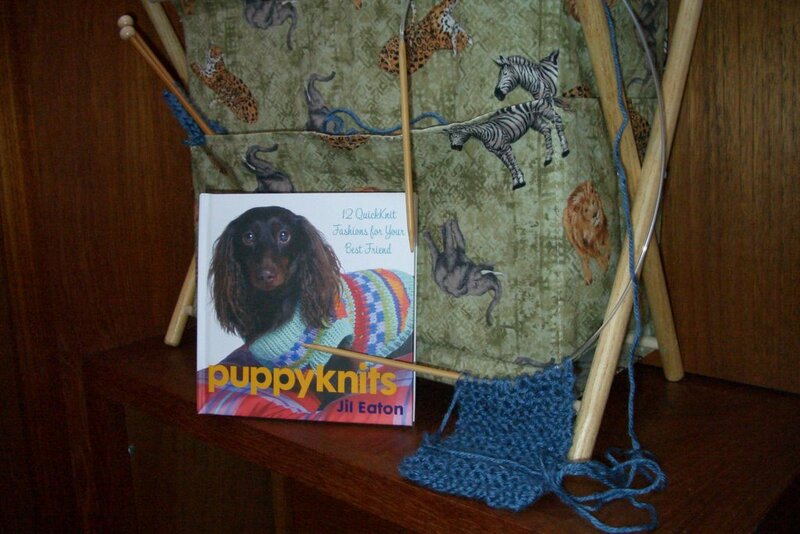 Fortunately, for my birthday I received this fabulous book Puppyknits by Jil Eaton with a variety of patterns and ideas for dressing your dogs in handknit fashions. 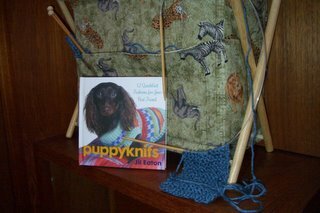 I had my first lesson on knitting yesterday. You can see my baby steps in the photo. I am using circular number 7 needles with some blue Simply Soft yarn. And today is the day to practice purl since it was the most difficult yesterday. Seems I am using the Continental method to knit with a Single Cast On. The Continental is apparently the quickest but sometimes yields looser fabric. The Single Cast On method is the simplest but not the neatest. Quick and simple - sounds good for a beginner like me. I will be practicing purl until I can get three or four rows that look uniform and nice. But I can only practice so much knitting... so I'll need to get some weaving done today too! Near the top of my "Woven Wanna Do" list today are two items 1) warp my eight harness table loom for the 20 bookmarks I need to weave for the bookmark exchange or 2) work on my small tapestry for the Grand Ideas/Small Format Exhibit. The first will take longer but the due date is further away. The second is smaller with a sooner due date. I also have three other projects with flexible due dates on looms in the house which might entice me also...stay tuned.